With the styling head, tools, and 4 cans of Play-Doh compound, there are so many fun hairstyles to create again and again. To start, simply take off Rapunzel's crown and load a Play-Doh color or 2 in the styling head. Turn the crank to watch her hair grow from the crown, then it's time to add length and style! 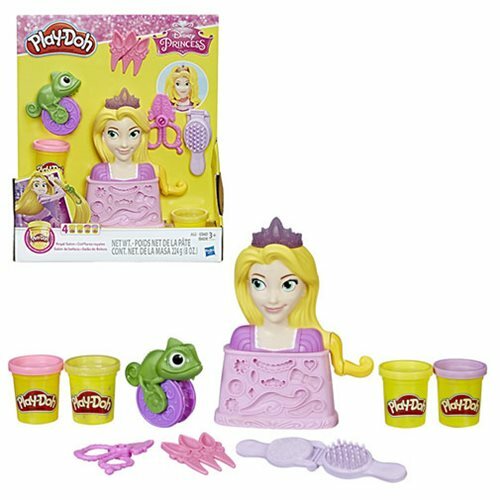 Includes Rapunzel styling head, Pascal braid roller, brush book-mold, scissors, comb, and 4 cans of Play-Doh Brand Modeling Compound (8 ounces/224 grams total). Ages 3 and up.